- Have some freakin’ fun! - Be professional in work and attitude. Yes this job gets very stressful, but keeping a positive attitude is important. Be a nice person. Say your “please” and “thank yous” like you parents taught you. Be the good example to your photographers and be kind and compassionate to everyone you deal with in your daily work. It makes a big difference and you don’t know what other people are dealing with, so a genuine smile might make all the difference. - Realize you’re not the best. You’re not the best. There I said it. If you’re always learning, you’re doing something wrong. There’s always someone doing something cooler than you and doing it better. Learn from them. Surround yourself with better photographers and you’ll up your game. Find good friends and have a beer and critique over recent photos you all have shot. Look at work you admire and study how they framed the image and composed it. Always actively think of making a good image. - Be bothered by the work you produce. Have conviction when shooting news. When you’re sympathetic to your subject, it really makes a difference in the image. Don’t blindly photograph, but think about what your images of tragedy will bring to enhance the story. I never want to get to a place where I am not bothered by the things I am covering. It can be hard on the psyche, but it makes you human. - Adapt with life changes. As much as some of the new social media feels dorky, you gotta get involved. If you can’t adapt, someone else will. As the saying that I learned goes: “Embrace change and make it your own.” Find a new way to create using whatever technology it is. Sure it can be overwhelming, but it can also help tell a story in a new way. I own lots of sneakers. Seriously, my closet is full of checkered Vans, hi-top Chuck Taylors and bright red Reeboks, but I needed a dressier pair of shoes for certain assignments and they had to be comfortable as most dress shoes aren’t. Enter Keens. They look clean and are stupid comfortable and have great support. It’s like walking on a cloud. Like you should take care of your back and not overwork your body, a good pair of shoes is key for longevity in this business. It’s a good investment if you want to ward off chiropractic bills. - Find new things to be excited about. Constantly try to push yourself in a new way of thinking. Shoot for fun and force yourself to do creative projects in your non-existent free time to experiment and play around with new ideas, so you can bring said ideas to your clients. Challenge yourself to think outside the box. 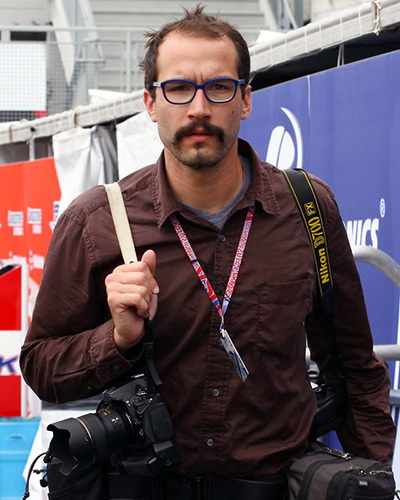 Nic Coury is a staff photographer with the Monterey County Weekly and a frequent contributor to the Sports Shooter Newsletter. Check out Nic’s work at his SportsShooter.com page: http://www.sportsshooter.com/members.html?id=7571.